There are few things more frustrating than booking what you think is a great hotel, and then learning about the woeful WiFi service you are subject to when you arrive… having almost certainly already paid for your stay. There may be a remedy for that, or at least a way to wise up on crappy hotel internet. Hotelwifitest.com is a website that does exactly as its name suggests, serving you search results for hotels which are ranked on the quality of their internet service. Quality of internet ratings exist in some hotel guides, but Hotel WiFi Test aims to go beyond merely crowdsourcing information thanks to its “state-of-the-art” machine learning technology which can predict the quality of on-site wireless. “The prediction tool works in a similar way to the actual thought process of an experienced traveler. People who travel a lot know that WiFi is faster in some cities and countries than in others, that certain hotel chains provide superior internet services, and that a number of other factors affect WiFi speed,” the company says. The site claims to cover over 100,000 hotels worldwide.You search based on city, and the results rank the hotels while showing a range of expected WiFi speeds, alongside all the usual metrics that matter: such as price, address and ratings from Hotel.com. It would take us a while to road test these ratings — I’m certainly game to do so — nonetheless the approach is likely to appeal to many, even as a guide not a factual site, since the internet is ubiquitous in day’s age. Plenty of us rank the ease in which we can get (and stay) online from our lodgings as an important factor in our booking decision. That factor becomes essential if you are traveling on business. 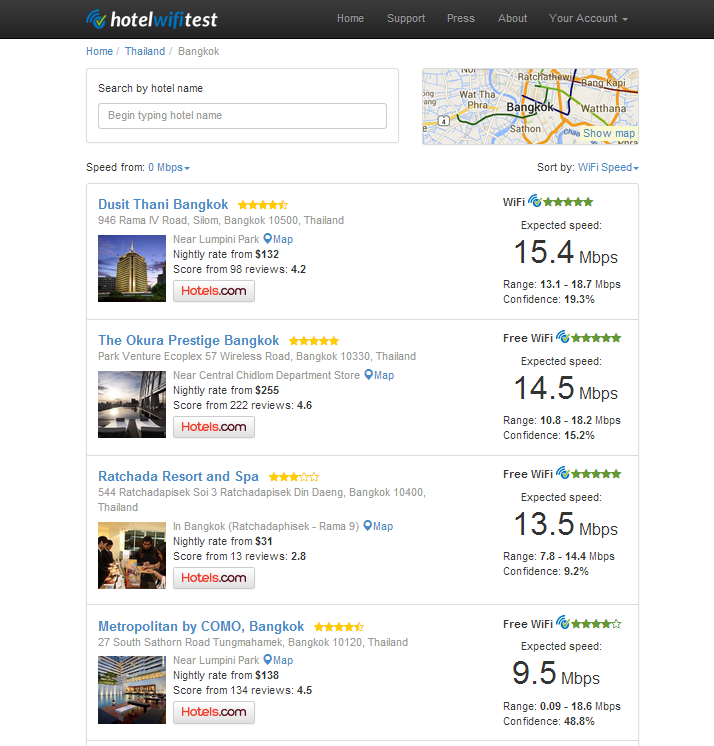 One more thing I’d like to see is the cost of WiFi at hotels included in search results. Given what we established above about the importance of the internet today — everyone walks around carrying a phone-sized web device in their pocket — charging people for something that has become so basic is tantamount to extortion. That said, most hotels do explain on their website whether WiFi access is free, so often it just takes some digging.